New Onyx sites are provisioned with a holding domain (e.g. onyx-demo.onyx-sites.io), however it's likely you'll want to connect your site with your own domain. There are two steps to this process, firstly telling connecting your domain to your Onyx site, covered in this guide, and secondly deciding how you want to point your domain to Onyx - either by adding a A record if you host your domains DNS elsewhere, or setting your domains nameservers to Onyx and making use of the Onyx DNS Tool. This guide walks you through connecting your domain to Onyx and deciding between the options for the second step. We have a separate guide on Using the Onyx DNS Tool. Would you like to redirect all requests to this domain to your primary domain? This field is essentially asking you if you want to redirect all visitors to this domain name to the first domain name you added to your site. For example, if you already have domain.com set up on your site and you are adding domain2.com then selecting yes here will redirect all visitors to domain2.com to domain1.com. However, if you use WordPress's multi-site functionality you'd not want this to happen at all and so selecting No is more suited in that case. Create www and bare domain versions? In the vast majority of cases this field can be left as is. Selecting yes will create the alternative domain name to that you entered in the initial domain name field. For example, if you entered www.domain.com then the Onyx platform would also create domain.com without the www. This is the intended behaviour for most web-traffic these days, however if you have a specific requirement and do not want the alternative domain created on Onyx then you can set this to No. You have two choices for this step, depending on whether you are managing the DNS for your domain on the Onyx platform or elsewhere. This method requires that you add/change the DNS A records for www and non-www variants of your domain to the IP specified in your Onyx site's Domains settings page. 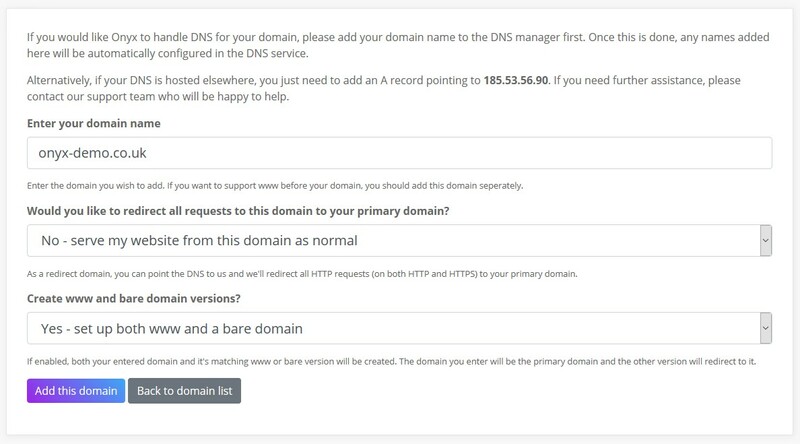 You will need to make these changes wherever you manage your domains DNS. Once the A records are added and DNS has propagated your site should be visible on the www / non-www variants as you have configured. 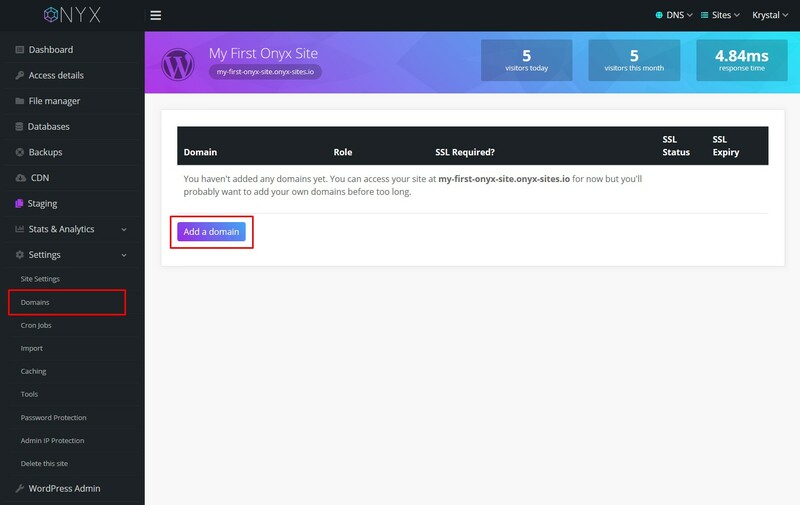 When you connected your domain Onyx will have automatically added a DNS zone with the correct entires for the options you selected (www / non-www). Should you wish to add other DNS records we have a guide on Using the Onyx DNS Tool. Changing your nameservers makes Onyx responsible for your DNS. If you make use of third party email providers or point other DNS records elsewhere you will need to configure these within the Onyx DNS tool prior to switching your nameservers. If you’d rather Onyx did not control your DNS then please see the Managing your DNS elsewhere section above.